I saw a recipe on Pintrest that looked amazing so I decided to give it a try. My comments and review are at the end. 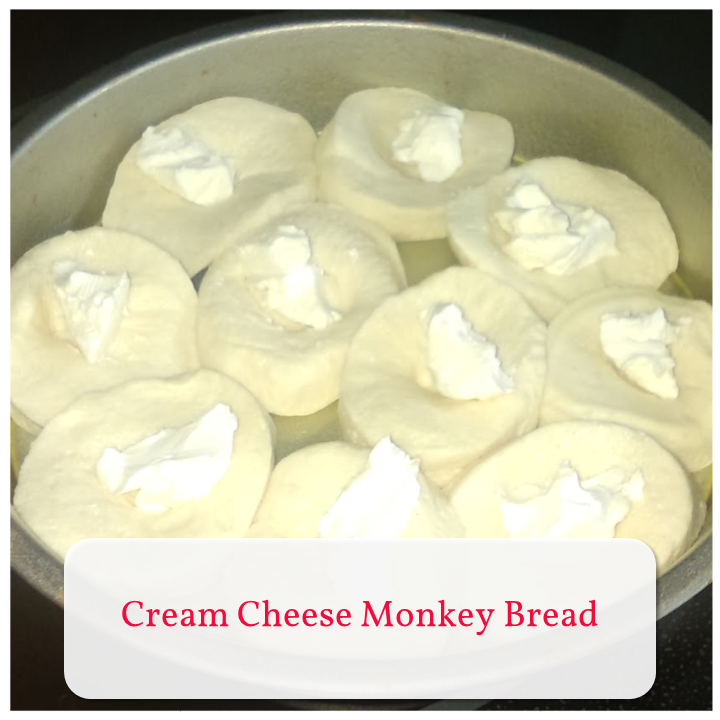 Here’s the original from Pip & Ebby, I’ve modified a bit Cream Cheese Monkey Bread. 1. Put the rolls into a pan. I used a round pan because it would be easier to clean than a bunt pan as used in the original. 2. Use your finger to make a divot in the rolls then add some cream cheese. 3. Melt enough butter to cover. 4. Sprinkle a good amount of cinnamon, sugar, and brown sugar over the top. 5. Bake until complete. I know it’s done because the smell begins to fill my house. See the final cooked product at the top of the page. The picture in the original recipe looked so much better than mine! Overall, I think I should have added MORE SUGAR!!! 1. I don’t think I used enough sugar. More sugars would have made it have more of a consistent taste. 2. There is too much bread! When I’m eating something sweet, I don’t like much of the original dough to be un-coated. Because the dinner rolls are thick, much of the inside of the bread tasted just like a typical dinner roll. 3. The cream cheese threw off the flavor a bit. I’m a big fan of cream cheese but I think because the cream cheese was just inside a large piece of dough, it was a bit boring and bland. A suggestion to remedy this and add flavor is to use a flavored cream cheese, Brown sugar and Maple would have been a great choice.